How many times have you been well on your way to your destination only to remember you forgot to arrange for someone to water your plants or worse, left the extra key hidden outside? It has happened to all of us at least once, that forgotten task on your mental pre travel checklist. Travel preparations completed in a methodical and organized manner prevents forgotten tasks. Putting pen to paper and manually checking off your tasks with our free downloadable pre travel checklist maintains order and helps to prevent leaving something to chance. 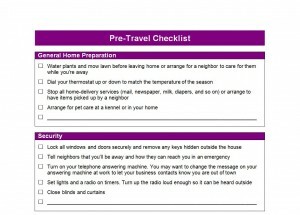 First, download the Pre Travel Checklist here and save a copy to your computer. Second, add any additional tasks needed by placing your cursor at the end of a listed task and pressing enter. This will add another bulleted line to fill in with your personalized need. Third, print a copy and check off each task as you complete it. Using a clipboard with a pen attached will keep the Pre Travel Checklist in an easy to find location. Divided into sections for organization; each section is fully customizable. Change the order of items by highlighting the line then dragging and dropping it where you would like it to appear. Changing the labels of the sections by simply deleting the current word and typing in a new label makes customizing this document a breeze. Choose and change the fonts by highlighting the letters you want changed and choosing your favorite font from the drop down box located on the upper left of the taskbar. To change the size of the font, repeat the above steps and choose the desired size from the drop-down menu located directly to the right of the font menu. If you want a different fill color in the header cells, click in the cell; locate the shading tool icon (which looks similar to a paint bucket spilling) on the toolbar. Next, choose your color by clicking on the arrow to the right of the shading tool and clicking the box of the color desired. Repeat the steps in each cell you want a customized color. Downloading our free Pre Travel Checklist puts organization at your fingertips with one simple, easy-to-use document. Save a copy to use each time you prepare to travel.